In this article, you will learn to work with arrays. You will learn to declare, initialize and, access array elements in C++ programming. In programming, one of the frequently arising problem is to handle numerous data of same type. Consider this situation, you are taking a survey of 100 people and you have to store their age. To solve this problem in C++, you can create an integer array having 100 elements. Here, the age array can hold maximum of 100 elements of integer type. The size and type of arrays cannot be changed after its declaration. How to declare an array in C++? Here, we declared an array, mark, of floating-point type and size 5. Meaning, it can hold 5 floating-point values. Elements of an Array and How to access them? You can access elements of an array by using indices. Suppose you declared an array mark as above. The first element is mark, second element is mark and so on. Arrays have 0 as the first index not 1. In this example, mark is the first element. If the size of an array is n, to access the last element, (n-1) index is used. In this example, mark is the last element. Suppose the starting address of mark is 2120d. Then, the next address, a, will be 2124d, address of a will be 2128d and so on. It's because the size of float is 4 bytes. How to initialize an array in C++ programming? How to insert and print array elements? 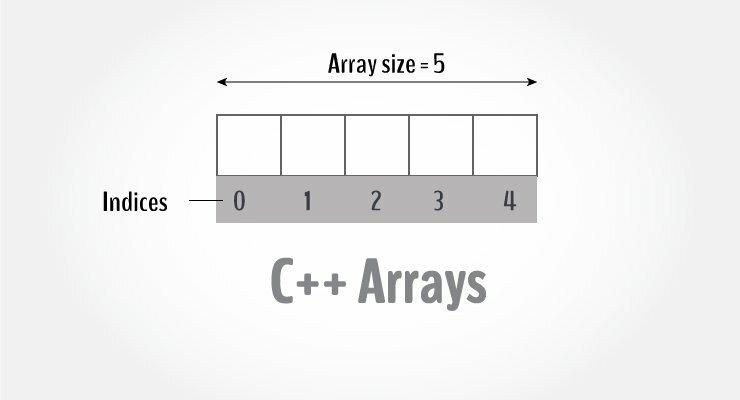 C++ program to store and calculate the sum of 5 numbers entered by the user using arrays. You can use the array members from testArray to testArray. If you try to access array elements outside of its bound, let's say testArray, the compiler may not show any error. However, this may cause unexpected output (undefined behavior). How to pass arrays to a function?